In 600 B.C., Jerusalem was flourishing, her bazaars laden with precious things from the farthest reaches of the ancient world, her citizens prosperous. Who could foresee that it would all suddenly vanish in smoke? One group. Into this world of illusive security came many prophets with a gloomy message. Jeremiah, Ezekiel, Nahum, Habukkuk, Zephaniah, Zechariah, and one Lehi spoke with the same unrelenting words of doom–unless Jerusalem repented of her idolatry, dishonesty, and corruption, she would be destroyed. Poised strategically on the path between two rival world powers, Egypt and Babylonia, Jerusalem, who had been a vassal to both superpowers, was, indeed, in a precarious position. When Lehi warned Jerusalem that it was about to be destroyed and that its inhabitants would be carried away to Babylonia, the people were furious. They saw him as a doomsayer–unpatriotic and divisive. His criticism seemed to be not only of their way of life but of their political allegiances. Passions ran high in the ill-fated city as the prophets’ words sounded like defeatism, negativism, treason. The corrupt elders demanded that they be imprisoned and executed for destroying the morale of the people. When a society is ripe for destruction, the Lord’s pattern is to save the righteous by removing them to a place of refuge. This was true for the Children of Israel who were removed from Egypt and the Jaredites who were removed from the Tower of Babel. Nephi consciously understood that his family was reenacting a spiritual pattern and reminds them of it frequently. In trying to convince his brothers to go back another time to try and secure the plates from Laban, he says, “Therefore, let us go up; let us be strong like unto Moses; for he truly spake unto the waters of the Red Sea and they divided hither and thither, and our fathers came through out of captivity, on dry ground, and the armies of Pharaoh did follow and were drowned in the waters of the Red Sea” (1 Nephi 4:2). The Mormon pioneers, crossing the American wilderness, called themselves the Camp of Israel and were also aware they were following a pattern laid down before them. In spiritual history, the place of refuge is the wilderness, idealized by Israel as the place to commune with God. Certain profound lessons are learned in the wilderness, especially our complete dependence on God for it is a trackless, difficult place where our own resources prove not to be enough. The wilderness experiences in scripture are for cleansing and clarifying, and it is only after a people has experienced the marrow-deep challenges of the wilderness that they are ready to inherit a promised land. When the Lord commanded Lehi to flee with his family into the wilderness, he voiced no objections, nor did he ask how to prepare for the journey. Evidence suggests that he had been a bold, resourceful merchant who already knew the ways of the scorching desert, a citizen of the world who had forged new markets, cultivated foreign contacts, was deeply aware of Egyptian culture. He had given his youngest sons, Nephi and Sam, Egyptian names, and had taught them to write in reformed Egyptian. He had established a great fortune and belonged to Manasseh, which of all tribes lived the farthest out in the desert. Not surprisingly, the Lord had fashioned Lehi’s life to perfectly prepare him for what lay ahead. Down past the treeless reaches of the Dead Sea, Lehi took his wife, Sariah, and sons, Laman, Lemuel, Sam, and Nephi, being directed toward a promised land where they could create a colony based on higher moral standards and purer traditions than apostate Jerusalem. Yet the little group already harbored the seeds of their ultimate destruction. Laman and Lemuel “knew not the dealings of that God who had created them” (1 Nephi 2:12) and thought their father’s visions to be “the foolish imaginations of his heart” (1 Nephi 2:11). Blind materialists to the bone, they did not believe Jerusalem could be destroyed. They lived for short-term satisfaction, grabbed for power, and whined without hope for the loss of their fortunes. Not knowing God, they could not trust His word, and their wilderness journey would be all heat and thirst and no purpose. Their younger brother Nephi, however, had “great desires to know of the mysteries of God” and cried unto the Lord until He visited Nephi. It was not attitude or good cheer that would make Nephi’s journey ahead so different from that of his brothers, but rather knowing the Lord. Having safely separated themselves by perhaps several hundred miles from the murderous threats of Jerusalem, Lehi’s sons were now commanded by the Lord to return to the city and obtain the plates of brass from their keeper, Laban. These were the sacred records of the Jews from the beginning and critical to preserving their language and understanding of God for their posterity in a new land. They contained the history of their people, including books not currently in the Old Testament such as the writings of Joseph, Zenock and Zenos. Twelve to fifteen days would have been needed to traverse the rugged desert of the Negev, span the scorching heat of Wadi Al Araba, and climb “up” the final four thousand vertical feet to Jerusalem. The Book of Mormon is consistent in the use of the words “up” and “down” which always refer to changes in elevation. 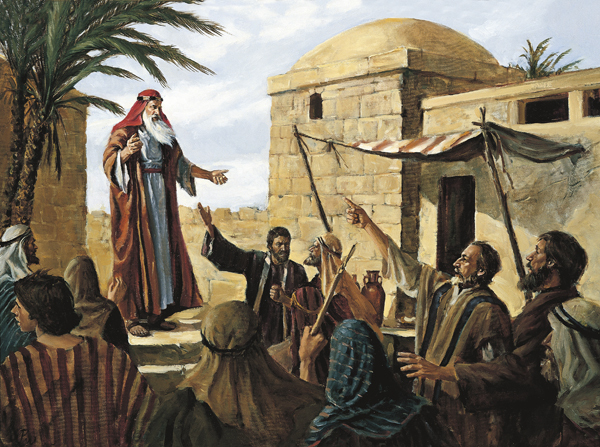 Nephi’s description of Laban, a powerful leader in Jerusalem, is a thumbnail sketch of the city’s utter decadence. He is a military type, perhaps a commander of fifty, very large, quick-tempered, lustful, unscrupulous, a cruel bargainer, and given to drink–and it is his type who is in control of the city and the Church. To Laman and Lemuel, this is an impossible fool’s mission and after two failures with Laban, they resort to beating Nephi with a rod until an angel came and stood before them commanding them to go up to Jerusalem again. But even an angel could not help Laman and Lemuel, whose faith was strictly in the arm of flesh. The angel had just left when they turned again to their murmuring; “How is it possible that the Lord will deliver Laban into our hands? Behold, he is a mighty man, and he can command fifty, yea, even he can slay fifty; then why not us?” (1 Nephi 3:31). The showdown has begun that will motivate much of the action in the Book of Mormon. The Lord is enticing his children to turn their backs on sin and know Him. The wilderness journey can play a key role in coming to understand who he is, but it is also a place of dividing those who know him from those who refuse his invitation.